Winter has a completely different meaning in Florida than other places in the US. While other states are dealing with inches of snow and Polar Vortexes, winter in Florida means we can all leave our homes without getting a heat stroke. It seems yogis are making the most of their winter wonderlands though. Instead of hitting up a hot yoga class, some are doing snow yoga, or snowga as it’s being called. Snowga ups the intensity of a regular yoga class in a similar way as hot yoga does, only it’s cold! It’s a lot harder to take deep breaths when the air is icy. Balancing can also become more challenging due to ice and snow. Many people love it though. It’s a chance to continue to practice yoga outdoors even when it’s chilly out. Poses are tailored so that people stay warm. Many wear heavy jackets and hats to prevent frostbite while they get their workout on. Don’t expect to see perfect poses or graceful flow, though. Due to the weather, it’s often bulky coats and toppling over. People who’ve practiced it say that’s part of the fun though. It’s a less intense environment. For those self-conscious about wearing tight yoga clothing, this also provides a unique opportunity. There are limitations to snowga though. The cold can limit flexibility and some poses can’t be achieved without an even surface. Yogis love the playfulness of these classes though. And don’t worry about it not being a serious workout. Most attendees don’t even feel the cold due to sweat they work up. Snowga became popular a few years ago in the US and Canada. It’s now made its way internationally, with people as far away as Russia practicing. Many ski lodges have begun offering snowga classes, which is a great way to warm up before hitting the slopes. So while we don’t offer snowga here in Bamboo Garden Yoga (we wish we could!) 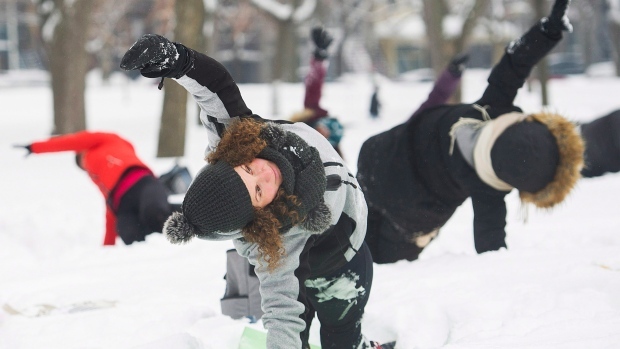 if you have a chance to do any snowga this year be sure to let us know how it was!